My grandmother surprised me with 24 cathedral quilt squares over the weekend. The squares were her first attempt at making a quilt that she started years ago. 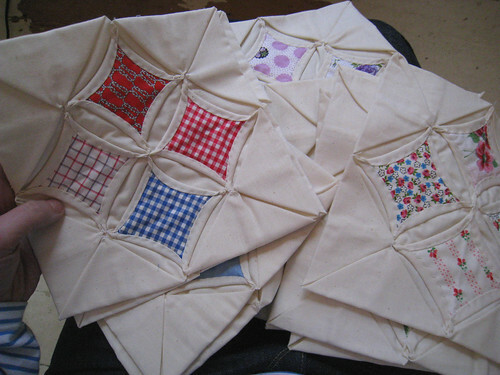 After reading about my new love for Cathedral Quilts last week she knew I should be the lucky recipient of the squares. I was thinking about sewing a few together and framing them as pieces of art. 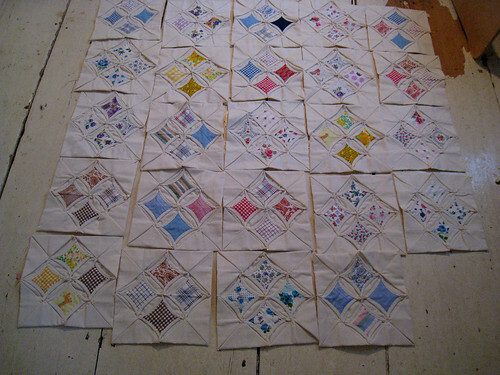 Or maybe I could make one more square to make the quilt an even 25? I love them. What a great gift! Thanks Grammy! The best part is that our grandmas usually used scraps from the old family clothing. I received a quilt top from my grandma and recognized some of my mom's old clothing, etc in it. What memories that broght back! Treasure that quilt – I love the idea that you might frame a square or two. A very loving gift from her. They might be cool as panels covering a boxed valence… your grandmother has a great eye for printed fabrics. They are all really great. I vote for making it into a quilt. I have a couple of ideas…instead of adding one more cathedral block, make one "odd" block to give the quilt some quirky interest…or use some of those wonderful fabrics in your collection to do alternate fabric squares using all your favorites! Your Grandmother does beautiful work. What a sweet gift! I love the fabrics your grandma chose. 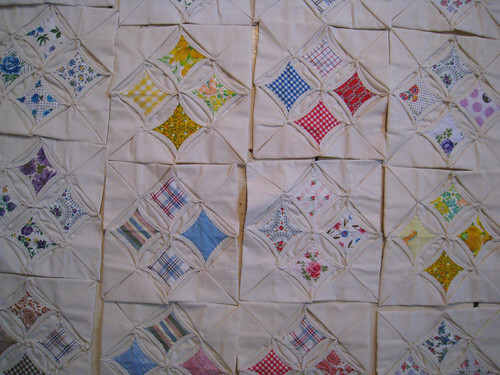 I agree with Melissa, A quilt four squares wide, and six long with a pretty border would be perfect. If you want to frame three of them, make it three wide, by seven long (with a border – it will be wider) It depends what size of bed you are fitting the wuilt to. WOW! So much of the hard work is done for you! Oh, you lucky, lucky girl! Sew one more and make a lap quilt. They are too beautiful for words. aww im jealous! i want a Grandma like that! What an amazing gift. 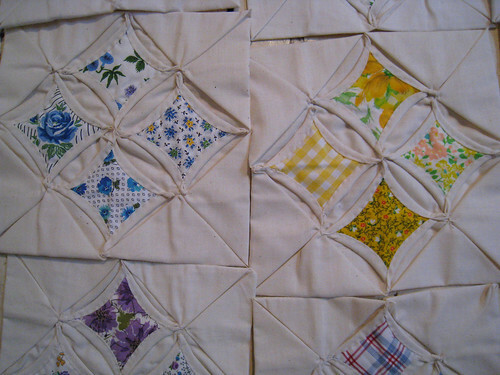 It would be lovely notion to see you make the last square to "complete" what your grandmother started and then quilt it up for hanging, or better yet, using. How lovely (and beautiful!). Looks like creative talent totally runs in your family. What a sweet Grammy.